Posted by Jon in Funko, Review, Street Fighter with 0 comments. Toy lines based on fighting game properties like Mortal Kombat or Street Fighter should be required by law to refer to “Waves” as “Rounds.” It would just make it easier to differentiate them from everything else out there in a post-Amazon world. The Savage World concept started with a series of figures from Mortal Kombat, one of the two fighting games that seem to be impervious to the test of time. Now we have Savage Worlds of that other game series, Street Fighter. The character selection in this wave is mostly to be expected. 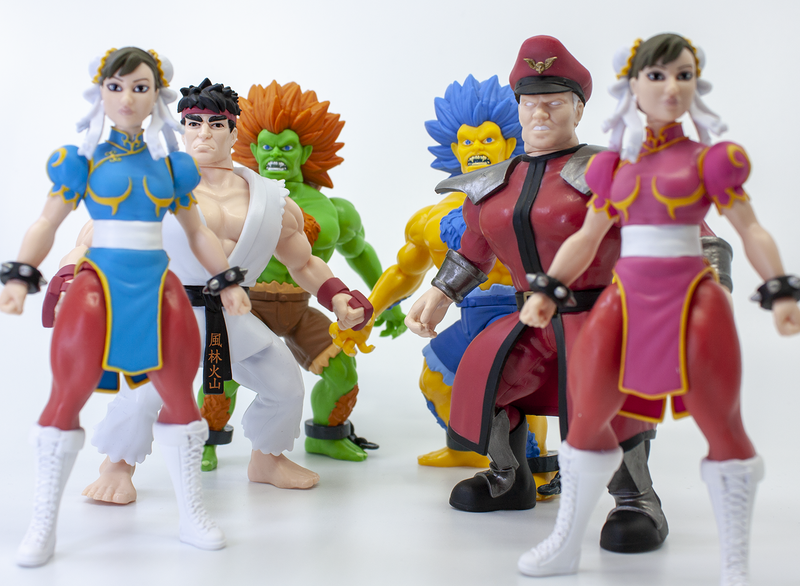 Just about every Street Fighter line kicks off with Chun-Li and Ryu. I can only assume that Capcom demands this at some level because it happens again and again. As far as I can remember, the only time Chun-Li didn’t make it into the first wave was the Resaurus line back in 1999. There could also be a case to be made for the Storm Collectibles’ series, but they release one character at a time so it’s a bit different. Anyway, the wave is rounded off with M. Bison and Blanka. Both are pretty solid choices. Blanka more so because he just fits the barbarian-style Savage World body so well. Blanka gets a yellow and blue “Player 2” chase variant while Chun-Li gets a pink and gold one. Is it just me, or does M. Bison look like a caricature of Michael Keaton? The likeness is almost so good that I have to believe it was intentional. Interestingly enough, he seems to be modeled after the Street Fighter 5 character art, while the rest artistically lean more Street Fighter 2. This figure series succeeds in what it sets out to do: fit Street Fighter into the Savage World toyline style. The sculpts are very strong and fun, especially those of Blanka and Chun-Li who really take to this aesthetic well. Obviously, if you are looking to put these guys into wild battle poses then this probably isn’t the line for you. But not to worry, there are a lot of other options out there.